Right Knee Open Autologous Cartilage Cell Implant | ¿Qué Onda Guero? You may recall I posted earlier this year that I was having some problems with my right knee. I had a tear in my lateral meniscus, which was repaired during an arthroscopic procedure done in June. During the same procedure, the doctor found a couple of chondral (cartilage) defects; one on the underside of the patella and another on the lateral side of the joint, where the meniscus was damaged. They took a biopsy during the scope and discovered that I inherited bad cartilage from somebody in my family. But because there was no damage to the bone yet, I was identified as a good candidate for cartilage replacement, a procedure in which my cartilage is reproduced in a lab and later implanted through open surgery. That’s where we’re at now. I had the cartilage implants done on Friday, December 4th. This is me, pre-op, shaved leg, cute blue footies and conehead-styled hair net (courtesy of Karen). I’m feeling fine right now; not too much pain. It does look a lot worse than it feels at this point though. 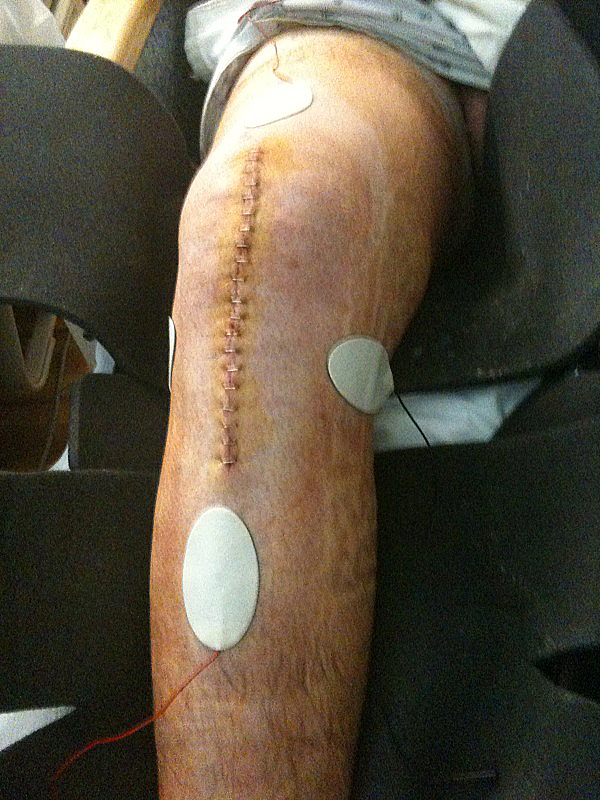 I’ve included a picture below of what I like to call Frankenknee, but you’ll have to click on the warning to see it. I didn’t wanna gross anybody out without a warning. Those white pads with the wires sticking out are for part of my therapy. The wires connect to an electro-stimulation device. Read about it here if you’re interested. It helps keep the swelling and pain down a bit. So there’s the update people have been asking for. Thanks for your thoughts and prayers so far. I’m looking at a 4-6 week recovery before I can get around on my own without too much difficulty. This entry was posted on Sunday, December 6th, 2009 at 7:18 pm	and posted in Uncategorized. You can follow any responses to this entry through the RSS 2.0 feed. « He Who Has Ears…. I’m so glad to hear you’re feeling fine and not in too much pain!